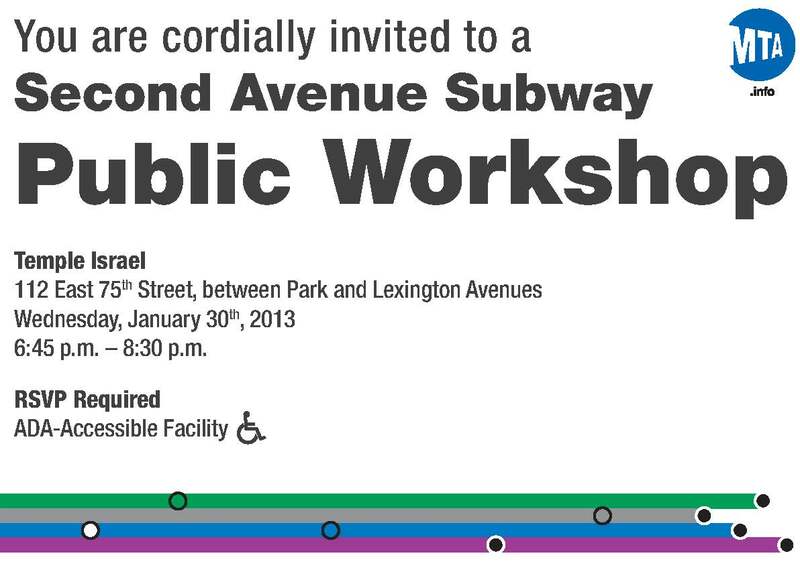 You are invited to attend an MTA public workshop regarding the construction of the Second Avenue Subway. The goal of this workshop is to maintain an open dialogue between the MTA and the community at large. Attendees will have the opportunity to engage project representatives about current construction activity and the initiatives implemented by the MTA as a direct response to community input from the previous SAS public workshop. MTA employees and contractors will attend the workshop to facilitate discussion and answer questions. RSVP: Reserve your seats online here or by calling (646) 564-5866. * The capacity of the facility is 200 people and seats are filling quickly, so reserve yours today. * Photo ID will be required for entry. * Facility is ADA accessible. This entry was posted in Blog, Citywide, East Harlem, Events and tagged 2nd Avenue Subway, East Harlem, East Side, Event, free, free workshop, MTA, NYC, Second Avenue Subway, workshop. Bookmark the permalink.